Nobel Laureate economist Professor Joseph E. Stiglitz emphasized that investigative journalists are needed to unveil the flourishing secrecy and root out corruption within the global economy. Speaking to an audience of over 1,000 investigative journalists, Stiglitz was in conversation with academic dean of the Graduate School of Journalism at Colombia University, Sheila Coronel, during a keynote address on the penultimate day of the Global Investigative Journalism Conference (GIJC). “When governments or corporations are engaged in bad practices they don’t want people to know, because if people knew they wouldn’t be able to do it,” said Stiglitz, explaining that the secrecy within the global economy is allowing money laundering to occur. “The reason [President] Trump doesn’t want us to see his tax returns is that either he did or did not report all his bad things, and now he’s cornered.” Stiglitz explained that the government of the United States of America and corporations try to justify secrecy as a requirement for commercial interest, but pointed out that when these entities sign contracts they represent the American people. Asked by Coronel how Africa compares to the rest of the world in terms of equality, Stiglitz singled out natural resources as one of the biggest problems in Africa. “There is a proclivity for people trying to appropriate for themselves the benefits of the natural resources,” he explained, adding that he thinks investigative journalism has played an important role in helping prevent African governments from doing this. 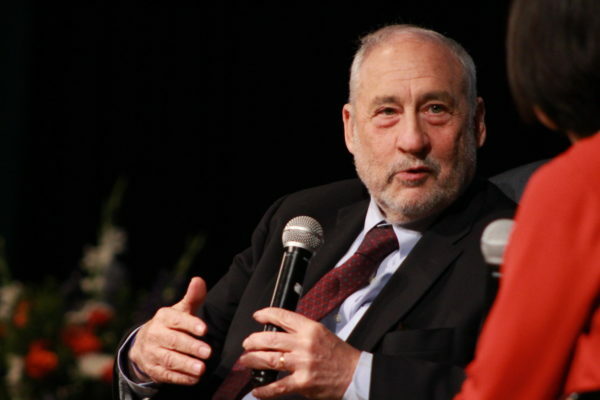 Stiglitz cited the Panama and Paradise Papers – the two biggest leaks of financial irregularity data in history – as examples of both the secrecy within the global economy and the necessity of investigative journalists. “This is going to be a long-term battle, the victories of the Paradise Papers and the Panama Papers are really important, but it is going to take constant pursuit of what is going on,” Stiglitz insisted. Closing the address to resounding applause, Stiglitz said, “My hope is that all of you investigative journalists continue exposing the dangers and the risks of Trump-like people to our society, our democracy and our economy… and that countries among the world will move to a new progressive era, with a new social contract, greater equality and less corruption.